A dark blue, jasper dip, sucrier and cover. 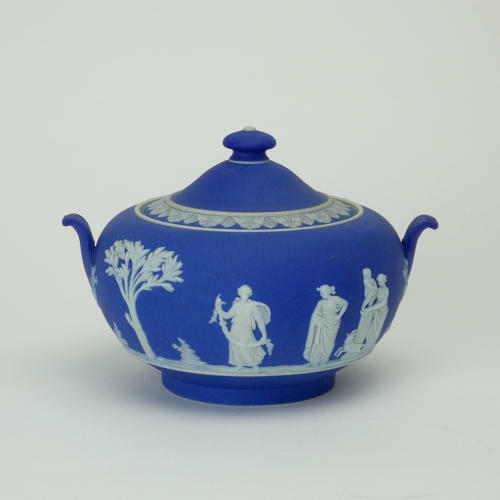 This is marked, to the base, 'WEDGWOOD MADE IN ENGLAND' and it dates from c.1920. There is also an impressed number but this is quite indistinct. It is decorated with a continuous band of classical figures and trees and the lid has a narrow band of foliage to the rim. The reliefs are all well detailed and the blue jasper dip is a good, rich shade of blue. Both the sucrier and lid are in excellent condition.